Lay It On Me, the drugstore version of Claire's Mixables. They're each three layers that don't mix together and the color in the bottle is one of the colors of the layers, sometimes with little bits of the other two colors mixed in. I didn't buy any of these, but I liked the purple, black and turquoise layered one. Which reminds me, I bough a ton of Claire's polishes a couple months ago, including Mixables and I haven't swatched them yet. Wet N Wild Chrome. Seven shades of chrome metallic polish in tiny bottles. I think they were $1.99 each, kinda steep for Wet n Wild in mini bottles. I bought the purple one, Patina, and I wasn't impressed. It wasn't metallic or chrome at all, just a pearly shimmer purple that was kind of sheer. I was thinking these would be awesome for Konad since they're chromes, but I haven't tried the other colors to find out of they're actually chrome or just pearly finish. Speaking of drugstore finds, I saw this brand I've never seen before: Freshcover. I bought three of the polishes to test them out and I LOVE them! It was a couple months ago, I almost want to say February or March? I haven't gotten a chance to swatch them yet either, but they're really nice. 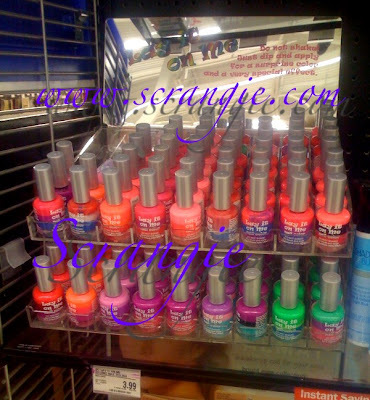 Also weird: Meijer had a brand new, full, untouched OPI South Beach collection display complete with color charts and display nails. On the topic of DS nail polish, I recently bought some Hot Topic polish. A deep purple, lime green, turquoise with gold shimmer, and a red like the purple irredesent you had and swatched. I've only tried the purple and neon green, and surprisingly, the purple had a matte finish when the neon green didn't. I've yet to try the red, but I think I'll erase the green to do so. the HD's are on clearance at my rite aid(im in northern california) for $2.00 per bottle, I picked up the whole collection for almost nothing! I was kind of bombed out when I couldn't find the purple one, but I got the teal and golden one (2 for 3 dollars) they were pretty awesome. 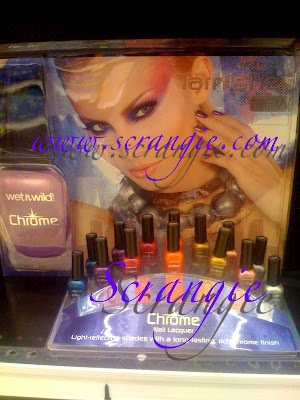 I've been waiting for the new Wet and Wild Chrome collection. At least if I don't like them I haven't spent too much money. I've never seen those Lay It On Me polishes before. It's weird when I see what is available at other drugstore chains. Meijer stores have Massini polishes, don't they? They're made by the same company as Color Club, and some of the colors are the same. Unfortunately for me, I only Walgreens in my area, so no unusual polish finds for me. Aren't full polish displays pretty? I just love going into the drugstore when they are all filled up. Thank you for posting this, I looooove seeing what types of products & polish's people get in their neighborhood drug stores. I love going to the primarily korean/asian-owned discount stores here and seeing what nail goodies they have :) always a good find whenever I go! the color selection is great- TONS of glitters and shimmers! Chrome would definetly look awesome for Konad. i hate mislabeled nailpolish. I usually stay away from drug store polishes anymore. They're almost just as expensive as OPI and China Glaze, no thanks! THE MIXABLES SEEM INTERESTING, I WONDER HOW THEY WORK? I love drugstore finds, thanks hun! Totally agreed, went to CVS...iphone in hand to peek @ your suggestions! Sally HD...not so much! It was very sheer? didnt get it. However....i did pick up a cleaver yellow (one of my FIRST, well yesterday i bought a china G one too) and i loved how creamy and saturated the color was...wait let me go get it now. K-it's called Lightening by Sally Hansen "insta-dry"